The changing weather patterns and seasonal shifts are negatively impacting agricultural ecosystems and compromising the benefits from production of agricultural goods and services. Such impacts include reduced farm returns, reduced household incomes, increase in poverty levels, and reduction in farm productivity and efficiency. 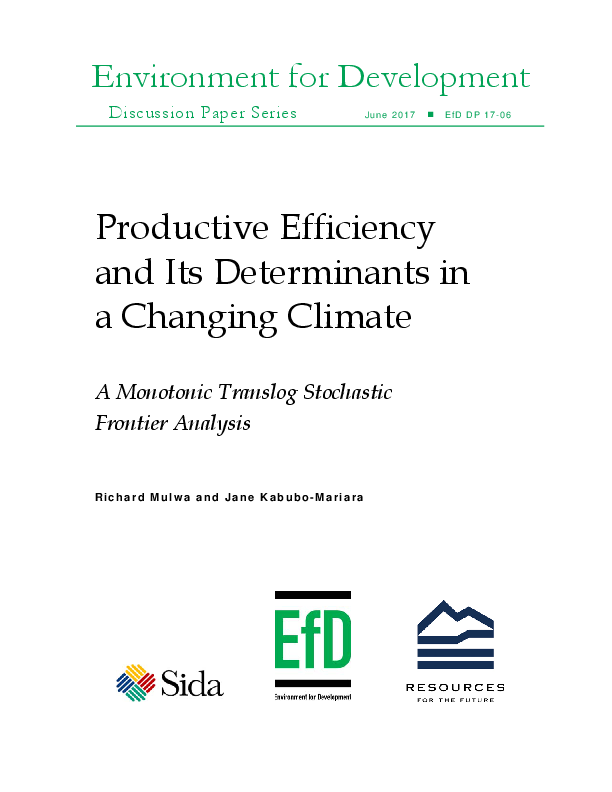 Using three waves of panel data, this study applies a monotonic translog stochastic frontier (SFA) to assess the overall farm efficiency and the influence of climatic factors, agro-ecological factors, and household factors on farm level efficiency. From the results, farming households are, on average, 63% efficient and could expand output by about 37% and still use the same level of inputs. However, this will be determined by a number of exogenous determinants such as climatic, agro-ecological, and household factors. Climatic factors such as rainfall and temperature decrease and increase inefficiency, respectively. The quasi-fixed factors of education and household size decrease and increase inefficiency, respectively, while age of the household head decreases inefficiency.